One Montgomery encourages MCPS’ ongoing evaluation of its gifted and talented, consortia, and language immersion programs and their conformity with the school system’s Core Values. These programs are afflicted with access and equity problems, as noted in the MCPS Choice study report. Montgomery County citizens have tolerated a system that exacerbates the achievement gap by offering to only some of our County students extraordinary programs and an excellent K-12 education. The remaining students, segregated by MCPS’ residence-based school assignment policy, are left with a separate and unequal education. Not only are those segregated students, families and neighborhoods injured, but the whole County suffers. The County’s future is impaired when the public school system fails to prepare all County students to be productive members of our community. Instead of launching these students, college- and career-ready, to higher education or skilled careers to eventually participate as County taxpayers with stable, thriving families, too many of our students are consigned by failed MCPS education to struggle to find gainful employment or to pay for remedial classes to learn what they should have mastered in the public education system. The data and analyses contained in the MCPS Choice Study make clear that MCPS is not serving all students equitably. The programs are too limited, information is available preferentially to parents who know how to go find it, and application processes are cumbersome, set up—whether intentional or not—to leave certain students out. As a result, students have very different educational opportunities and experiences within the same school system, and sometimes within the same school. participating in regional and national competitions? Why are these outstanding opportunities only available to a small segment of the student population? One of the reasons for this disparity is that politics drive decision-making about education, which rewards the “squeaky wheels” of politically-savvy, well-connected and often affluent parents- those families whose children already have distinct education advantages. We intend to add another voice to the conversation, perhaps one that has not been heard from . One Montgomery supports MCPS’ professed Vision, “We inspire learning by providing the greatest public education to each and every student.” We are committed to holding the Board of Education and MCPS leadership accountable to deliver on this promise. It is incumbent upon the community and public services, including MCPS, to make up for various disadvantages faced by students, and that this is the only way to truly address the achievement gap. In accord with the Metis Report findings, One Montgomery Leadership Team member Will Jawando, recently filed a civil action with the Office for Civil Rights charging that “MCPS has violated and continues to violate Title VI with respect to the manner in which it administers recruitment and selection of students for admission to its highly-popular, language immersion programs at the elementary school level.” He specifically argues that his child and other children of color are excluded from MCPS special programs. This civil rights charge makes clear that it is time for MCPS to take action on the MCPS Choice Study findings. MCPS needs to expand the capacity of choice programs, both to meet growth in enrollment and demand, and to improve outreach to underserved communities. Our school system is the cornerstone of our county’s success, and it only works when all students have access to a high-quality education regardless of race or background. One Montgomery endorses Sebastian Johnson for the Montgomery County, Maryland Board of Education at-large seat in the April 26 primary election. Organized in 2013, One Montgomery is a grassroots organization of parents, teachers, and community members in Montgomery County that is dedicated to public school improvement as a means for creating a stronger community. 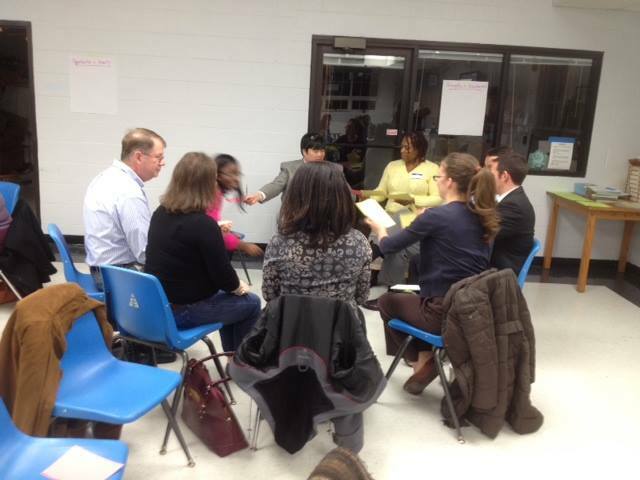 The group seeks a school system committed to school equity, transparency, collaboration, and accountability. As a recent MCPS student, a former student member of the Board, and a former teacher in a high-needs school, Sebastian brings new, much-needed perspective and dedication to the Board of Education. His story illustrates how strong schools can help close the achievement gap for disadvantaged students and help them excel. He has a keen understanding of the challenges our school system faces. He is willing to work with all parties, from parents to Board colleagues and MCPS leaders to the County Council and state leaders, to make sure that MCPS is equipped and accountable to help every student, regardless of background or zip code. Candidates endorsed by One Montgomery have records of community and political activism that prove their commitment to closing the achievement gap. This endorsement was made based on candidate questionnaires, interviews, and public statements. 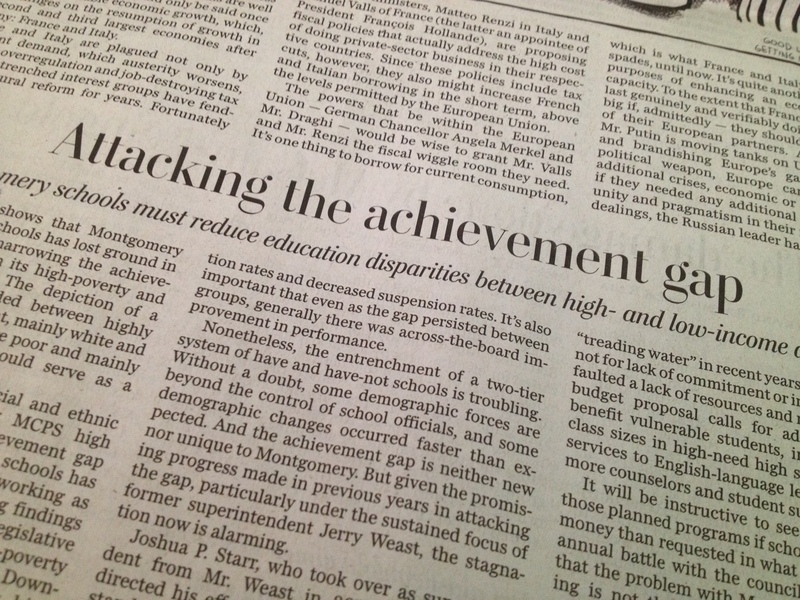 A recent report on school performance by Montgomery County’s Office of Legislative Oversight shows that the achievement gap in county schools has grown in recent years, particularly between schools in the Northeast and Downcounty consortia and the Upcounty and schools in the more affluent western side of the county. Because geographical boundaries almost always determine school assignments, school quality is closely tied to neighborhood stability and the health of our local economy. As a result, Montgomery County Public Schools needs to dedicate adequate staffing and implement programs for high-needs schools to ensure high-performance by schools in all parts of the county. We endorse Sebastian Johnson because he understands these needs and can be expected to hold MCPS accountable to address them. One Montgomery has produced a set of recommendations for ways MCPS can do that, using feedback from community workshops and education forums it has organized or participated in over the past two years. For further information on One Montgomery, visit its website or Facebook page. Follow One Montgomery on Twitter @onemontschools, or join One Montgomery’s listserv. One Montgomery can be contacted at onemontschools@gmail.com. Provides staffing at schools that reflect the student population in an effort to become a culturally and linguistically competent system. There is an inadequate number of Spanish-speaking staff members available to speak with Latino parents to answer their questions and generally assist them in supporting their students. Provides ongoing professional development to teachers and staff to support them in affirming cultural diversity in MCPS classrooms. Allocates the necessary college and career resources to ensure that all Latino students have paths to future success. This includes prioritizing a career readiness program for students enrolled in English for Speakers of Other Languages (ESOL) classes and older students with interrupted educations; ensuring small class sizes for students with increased educational load; and providing mentoring and additional supports for students who may struggle academically. Provides meaningful access to policy and decision-making processes for the Latino community. To further this inclusive process, the new superintendent should articulate a clear strategy and create mechanisms in MCPS and the Board of Education to facilitate the participation of the Latino community in key debates and crucial policy decisions. This includes strategic plans for the county, the budget process, and other policies having large-scale impact. Engages in system-wide transformative reform to ensure that MCPS adopt policies and practices that enable Latino families to participate in the school lives of their students. Montgomery County Latino Advocacy Coalition (MCLAC) is a group of community leaders and organizations that support the achievement of Latino youth and the wellbeing of community members. MCLAC includes organizations such as CASA de Maryland, Identity, Maryland Multicultural Youth Centers and numerous other organizations as well as parents and business leaders. For more information, you can read MCLAC’s Letter to the BOE and a MCLAC Fact Sheet. As Montgomery County Public Schools seeks a new superintendent, how can we ensure that high-needs schools will have the leadership they need? 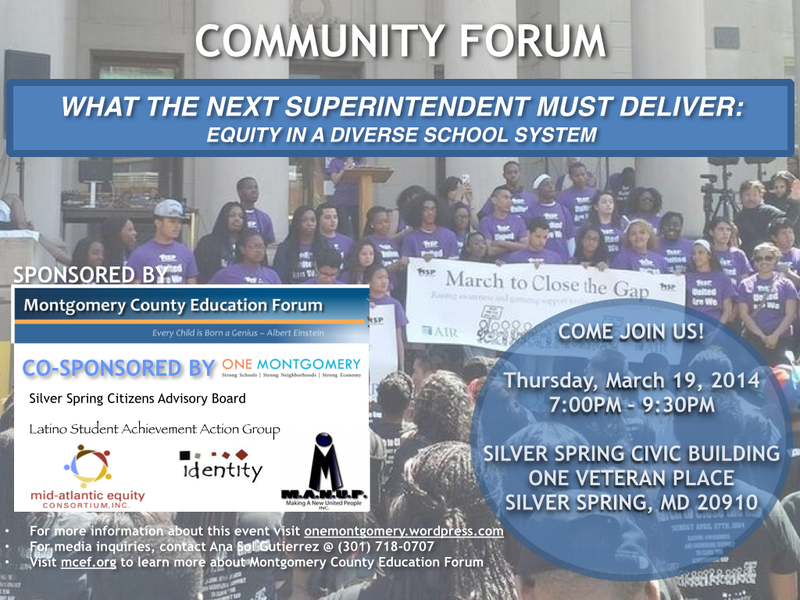 Join us and the Montgomery County Education Forum for “What the Next Superintendent Must Deliver,” a community forum on how the next superintendent of MCPS can best meet the needs of a growing and diverse school population. We’ll have speakers including both education experts and MCPS students and take a detailed look at our 13 questions that the Board of Education should consider in finding a new superintendent. The meeting’s next Thursday, March 19 from 7 to 9:30pm at the Silver Spring Civic Building, located at One Veterans Place in downtown Silver Spring. For more information or to RSVP, check out our Facebook event page.